Writing is good medicine. 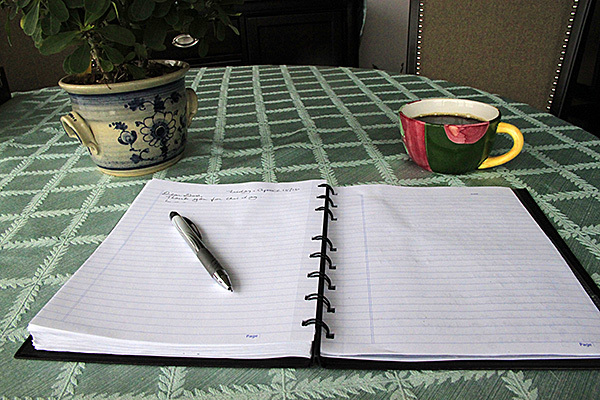 Keeping a journal is good for your emotional well-being. Writing letters to God in your journal is even better. It helps you emotionally as well as spiritually. Writing letters to God has been key to helping me cope with my mental health issues. Author Lynda Monk wrote, “Expressive writing promotes healing and can help us to better control our emotions, to stop ruminating or obsessing about a traumatic event and instead derive meaning from what happened.” Through expressive writing we can clear our minds from a clutter of painful memories. If you have experienced trauma, face your story and share it with someone you trust. Many have found their journal to be the best place to do so. As I dealt with traumatic memories over the past few years, I found that friends quickly tired of my complaints. I saw counselors, but they were not always available. I find keeping pain to myself unbearable. It needs to be released, to be unburdened. And so, I’ve learned I need to write God about it. God has more compassion than any earthly friend could have. Not only that, he has endless patience to listen. I “talk” to him daily, honest about my brokenness, praying that he will give me the strength to carry on. All you need is a pen and paper and fifteen or twenty minutes of nonstop writing a day, honestly reaching out to God with words from your heart. He will understand your pain better than anyone because Jesus’ own experience with pain surpasses anything humans have felt. I have been publicly sharing my pain over the past couple of years. There are three reasons for doing this. By openly telling stories from my life with mental health problems, I believe stigma can be reduced. The public needs to hear and understand the extent to which such stigma can affect people’s lives. I also want to encourage others who live with such issues, showing them they are not alone. When I finished writing THE DAY MY LIFE CHANGED, which I sent out as a link a few weeks ago, I felt I had at long last managed to tell the most important part of my story in full. Although it was God I wrote to, I felt like a child who had previously been unable to talk about everything. It was as if I was a child, finally telling her mother exactly how she had been hurt in every detail. To be listened to with such patience and compassion was a comfort. I believe I have now been able to put writing on this topic to rest. I can finally let the pain go.